"If you see an 'Oops! This link appears broken' message, the Toolbar has detected the page you were trying to open couldn't be found. 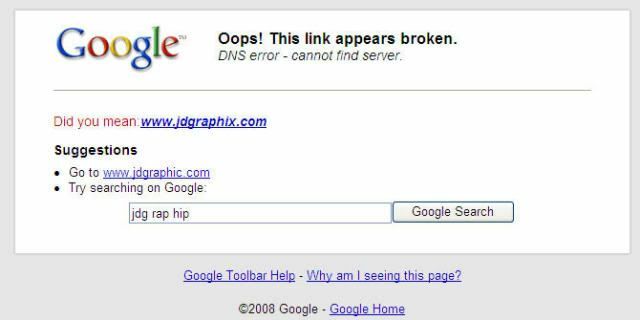 Instead of the default 404 or DNS error message that usually appears, you should see a Google search box with helpful suggestions for locating the information you were trying to find, such as pages with similar addresses. 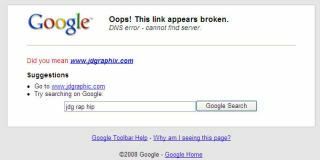 If you'd like to search Google for pages similar to the broken link, click the Google Search button." I didn't get a chance to take a screenshot of that Google error page and when I tried to refresh it, the actual page loaded on Pampers.com, which leads me to believe Google is sniffing the page load time rather than actually checking if that page exists. Now, in many cases with sites that don't have custom 404 error pages, landing on a Google search page may actually be a preferred outcome but I think it's a pretty bold move by the Big G to steer traffic away from publishers like this. Bottom line, as if the SEO benefits of having custom 404 error pages wasn't enough, here's a pretty tangible reason to get those in place asap. Update 2: Apparently this is not a new (or secret) development. Google announced that this functionality was part of the updates it made to its toolbar at the end of last year. I just got a new laptop and re-installed the latest version of the Google toolbar which is probably why I'm seeing these pages for the first time. Thats a DNS error, not a 404 error.